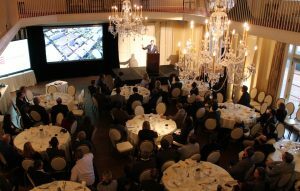 One of Richmond’s most powerful executives and fundraisers took his case for redeveloping a swath of downtown to area commercial real estate brokers Tuesday, revealing new details about the $1.4 billion proposal in the process. Tom Farrell, the Dominion Energy CEO who is spearheading the proposed Navy Hill redevelopment, presented the project that would include a replacement of the Richmond Coliseum to members of GRACRE, the Greater Richmond Association for Commercial Real Estate, at a breakfast Tuesday morning at the Country Club of Virginia. Displaying a sometimes-wry sense of humor despite fighting a cold, Farrell provided an overview of the proposal that he described as transformative for Richmond. He also encouraged attendees to show their support at meetings when the project and enabling legislation is presented to and reviewed by City Council – a process he expects will start soon. 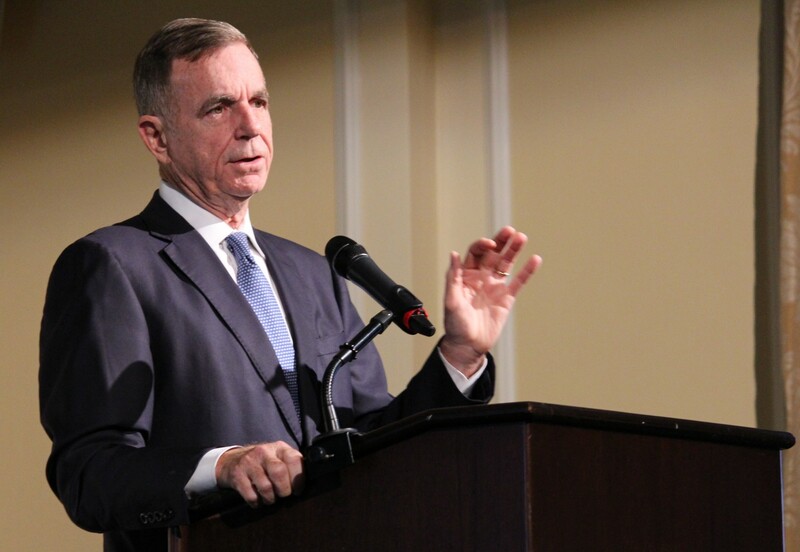 The presentation was made at GRACRE’s meeting Tuesday at the Country Club of Virginia. 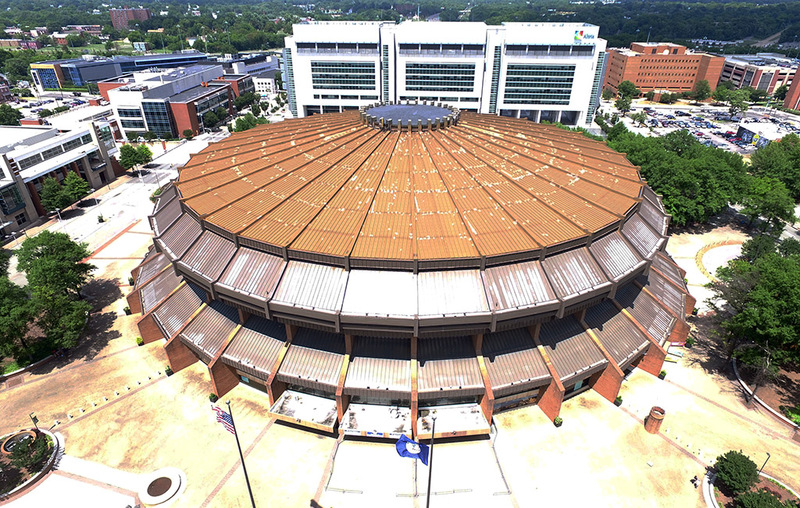 Among new information Farrell shared about the project is that the Coliseum’s replacement, planned to be a 17,000-seat expandable arena, is being designed by the same group behind the new Mercedes-Benz Stadium in Atlanta, where this year’s Super Bowl will be played. But Farrell stressed that the project is not just about the arena, listing other components that the city required in a 2017 RFP, to which Farrell’s group, NH District Corp., was the lone respondent. Those components include a renovated Blues Armory, an anchor hotel for the Greater Richmond Convention Center, mixed-income and affordable housing, a new bus transfer station, local job creation and a financing plan with no moral or general obligation to the city. 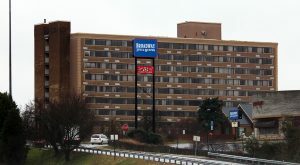 The group responded with a proposal that Farrell said would meet all of the city’s requirements, including creation of 9,000 permanent jobs and 12,500 construction jobs, with $300 million in contracts to be set aside specifically for minority-owned businesses; a 527-room Hyatt Regency-brand hotel; and 680 income-based housing units that would add to 2,520 market-rate apartments. Plans also call for replacing the GRTC transfer center along Ninth Street; new build-to-suit office buildings, one of which Farrell said has a commitment from VCU; and putting a 20,000-square-foot food court, 900-seat music hall and a ballroom in the armory, an historic building that was part of the 1980s-era Sixth Street Marketplace – a failed project that Farrell said he’s heard enough about. 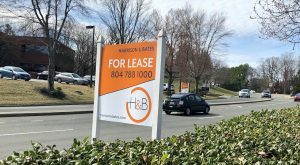 The group has retained Fairfax-based Concord Eastridge and CEO Susan Eastridge, along with Michael Hallmark and his Los Angeles-based Future Cities, as master developers of the project through an entity called Capital City Partners. The $1.4 billion investment would be funded in large part through the establishment of a tax-increment financing (TIF) district, in which real estate tax revenue from new development in the district would be used specifically to pay for the project. Plans call for the TIF district to cover areas beyond the 10-block project area, spanning a chunk of downtown bordered to the west and east by First and 10th streets and to the north and south by Interstate 64-95 and the Downtown Expressway. The expanded area includes the new Dominion tower under construction on South Sixth Street and the site of a planned second tower nearby. Farrell said the size of the proposed TIF district is needed because much of the downtown properties involved are nonprofit- or government-owned and do not generate taxable revenue. 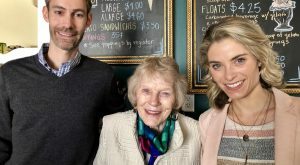 He said such districts, while less common in Virginia, have been used to success in cities across the country, such as in downtown Indianapolis and Dallas. The new incremental revenues from the TIF district, which would be managed by Union Bank, would be used to pay back $300 million in non-recourse revenue bonds to be floated by the city and underwritten by JPMorgan Chase and Citigroup. The project’s remaining $1.1 billion cost would be fronted by NH District Corp.’s investors, who the group has not identified. Additional incremental revenues projected from the project would be allocated, as Mayor Levar Stoney announced last year, with $600 million going to schools, $180 million to housing, $12 million to support local arts initiatives and $400 million to support general city services. Tom Farrell discussed the potential of the project to transform Richmond. Farrell acknowledged further review would come from City Council, which last month approved the formation of a commission to review and advise them on the proposal when it is presented. 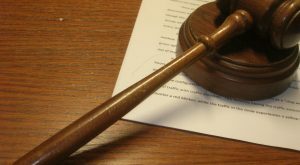 Farrell said the proposal and enabling legislation is being finalized with guidance from Roth Jackson attorneys Mark Kronenthal and Jennifer Mullen. He said negotiations continue with the city about certain details of the proposal. Clarification: Hunden Strategic Partners conducted the third-party analysis of the NH District Corp. proposal. Davenport & Co., the city’s financial adviser, has presented the analysis but was not involved in it. An earlier version of this story incorrectly described both companies as having conducted analyses. 16 Comments on "Farrell pitches Coliseum plan to brokers group at CCV"
I’d love a new arena and do like the idea of cost inclusive living space. But how will we book at 17,000 seat arena enough days of the year to make it viable? We are not going to get an NBA team and I don’t see VCU leaving the Siegel Center. As much as we love them, they are mid-level NCAA and would play to a lot of empty seats if they played there. Please don’t use the existing Coliseum as a bellwether for future performance (no pun intended). Don’t be surprised, when someone says the existing facility is barely suitable for anything, and it is not marketed – or desired. 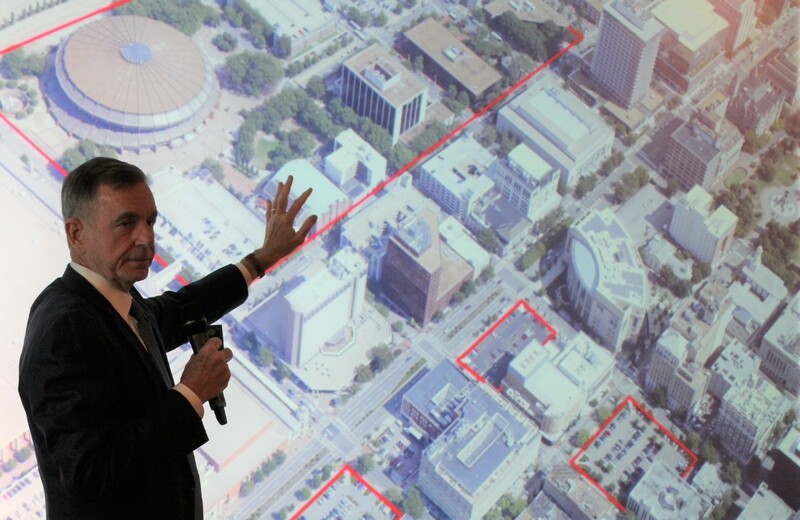 How would you tear down the coliseum and restore the grid without using public funds? Agreed, a sports complex of sorts with the Diamond and Coliseum makes more sense to me, along with the easy of parking and connection to the interstate. I feel like the thinking that having it ‘downtown’ somehow draws in substantial increases in business is an old way of thinking. Event facilities entice you to spend your money inside the event with food and merchandise. When we go to games in DC and Baltimore the only money we spend outside the game is for parking. Just my opinion. Many of us do spend money in both the venue and then neighboring businesses after the game, especially if we have to avoid the rush of traffic leaving. Formally, this is the case with the Arena Football games (Lucy’s, Jackson’s Beer Garden, etc). Unfortunately, the Diamond is less connected to the eateries along Boulevard but even still restaurants are packed in the area after the game. A key element is better mass transit to the venue rather than having to worry about parking costs and post-game traffic, something also lacking with the Boulevard site. No public funds! The residents of Richmond cannot afford to be fleeced again. Do we ever learn from our nearly 100% failure rate of these vanity “reinvent Richmond” projects? Thank you, Michael Dodson, for an objective perspective from a businessman with integrity who isn’t simply looking to line his own pocket.